VIRGINIA BEACH, Va., (GLOBE NEWSWIRE) -- Huntington Ingalls Industries (NYSE:HII) announced today that its subsidiary AMSEC has signed an agreement with Hanjin Heavy Industries and Construction Philippines, Inc. (HHIC-PHIL), a subsidiary of HHIC Holdings Co., Ltd. to work together in providing maintenance, repair and logistics services to the U.S. Navy and other customers in the western Pacific region. The agreement with HHIC-PHIL allows AMSEC to benefit from Hanjin's state-of-the art shipyard at Subic Bay, Philippines, and accelerate Hanjin's growth into the maintenance, repair and logistics services as the U.S. Navy increases focus in the Western Pacific region. Pintoresco Advisors has been invited to be a featured speaker for DealFlow in New York City. 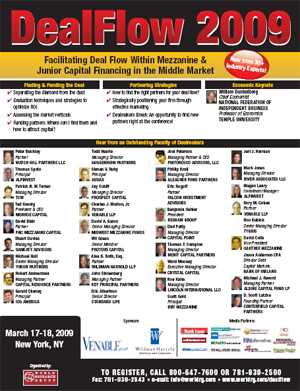 The two day conference is sponsored by some of the biggest names in the industry and will help facilitate deal flow in the mezzanine and junior debt markets. Joel Peterson, Managing Partner & CEO at Pintoresco Advisors will be a specially featured speaker during the height of the conference. SK Group, a $76 billion global Korean conglomerate, announced its exclusive engagement of Los Angeles-based Pintoresco Advisors, LLC to help SKC Inc., the U.S. subsidiary of its global advanced materials division, launch its latest investment efforts into the U.S. and other markets. Using mergers and acquisitions, SKC Inc. intends to increase its U.S.-based revenues in advanced materials from $200 million to over $800 million over the next two years. "We were especially impressed by Pintoresco's capabilities, insights, and deep relationships." Stated Mr. Ho Jin Kim, President of SKC Inc. "After reviewing proposals from Wall Street and Big Four firms, we have exclusively engaged Pintoresco Advisors, based on their expertise, track record, and flexibility to help us accelerate our investment efforts. In part, through the services of Pintoresco, we anticipate more than quadrupling our U.S.-based businesses over the next two years." SKC plans to create an integrated production system for all display films and lead the world's display and advanced materials industry. SKC's polymer film division has grown into the world's fourth-largest producer of film products, with exports to 150 countries and sales of $1.3 billion. SKC's display materials business is expanding from the LCD optical film market, where it is the world leader. Joel Peterson, CEO & Managing Partner of Pintoresco stated, "We could not be more pleased to be engaged by a global leader like SK. SK is on the cutting edge of innovation in advanced materials that will launch a whole new set of materials which will drive the next generation of technology and renewable energy. Pintoresco has pioneered boutique M&A services to Korea and we're very pleased to be asked to assist in SKC's achieving its strategic goals." 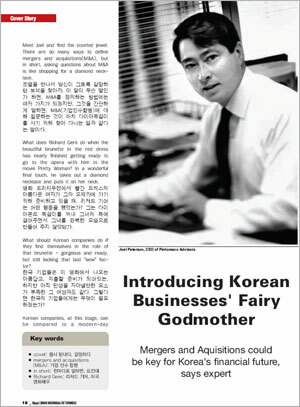 SK Group was established in 1952 in Seoul, Korea. SK Group is composed of 56 affiliate companies that share the SK brand and culture. The third largest Korean global conglomerate, in 2006, SK Group reported combined revenues of $75.8 billion, with exports contributing $26.4 billion of that total. SK Group has more than 25,000 employees who work from 113 offices worldwide. It changed its name from Sunkyung Group in 1997. Pintoresco Advisors, LLC is headquartered in Los Angeles, CA, with presence in Colorado, Georgia, Virginia, and Seoul, Korea. It provides advising and consulting services, offering a wide range of M&A, corporate finance and strategic advising. Its principals have collectively executed over $30 billion of mergers, acquisitions, divestitures, financings, partnerships and other complex business deals and transactions. The firm has special expertise and focus on U.S./Korea transactions, in part through its partnership with Byung Chan Ahn & Co. CPAs. ANDAMIRO Co., Ltd. announced today its engagement of Pintoresco Advisors LLC to help it launch its latest product innovation into the U.S. and European markets. ANDAMIRO is a leading Korean designer and manufacturer of arcade video games and electronic equipment for the casino and gaming industry. ANDAMIRO is best known for inventing one of the world's most popular and successful arcade games ever, Dance Dance Revolution (also known as Pump It Up). ANDAMIRO is unveiling its newest innovation, JamBeat, a unique handheld, wireless electronic "beat box" that lets people make endless varieties of original Hip Hop music, do impromptu DJ sessions and wireless pick up jam sessions with up to 5 JamBeats. "We are finalizing JamBeat for the mass consumer market and have already received interest from distributors in Korea and Japan. We believe that JamBeat meets a convergent demand in the U.S. and European markets, where people are looking for ways to create their own Hip Hop and popular music and to be able to share their creativity with friends through wireless jam sessions as well through the JamBeat website and the internet." Stated Mr. James Ko, President of ANDAMIRO USA, Inc.
"We have teamed up with Pintoresco Advisors, based on their expertise and track record, to help us accelerate our entry into these two vast, important markets." Joel Peterson, CEO of Pintoresco stated, "We could not be more pleased to be engaged by a leading innovator like ANDAMIRO. JamBeat is yet another cutting edge innovation that will launch a whole new stage of musical development in current popular music, and we are excited to be chosen to play a part in this evolution." "Byung Chan Ahn & CO. CPAs has had a long, close relationship with ANDAMIRO and we are very gratified that our partnership with Pintoresco will bring the needed expertise and services that ANDAMIRO needs to launch its latest innovation," stated Mr. Byung Chan Ahn, president of Byung Chan Ahn & CO. CPAs. Andamiro was established in 1992 in Seoul, Korea and has over 15 years of experience in field of innovative arcade and electronic game design and manufacture. Its continuous re-investment in the development of new products has already made Andamiro one of the leaders in the field of game development. With all its knowledge and resources it views the next years as a stepping-stone into the next stage of even more exciting and innovative products for the gaming entertainment industries. Byung Chan Ahn & Co CPAs offers a full range of services in the field of tax, accounting, business consultation and information technology. Established in 1993, the firm has become a leading public accounting firm in the Los Angeles, Mid-Wilshire as well as Orange County areas and is rapidly expanding its business. The firm's goal is to fulfill the needs and expectations of its clients as a quality professional service provider. It has demonstrated the proven expertise to help increase profitability and solve problems in each client business. Pintoresco Advisors LLC provides highly selective advising and consulting services, offering a wide range of M&A, corporate finance and strategic consulting to boards of directors, business owners and management teams. Its principals have collectively worked with firms operating in a broad range of industries, and have successfully executed over $30 billion of mergers, acquisitions, divestitures, financings and other complex business deals and transactions. The Dongbu Group, 8th largest South Korean Chaebol with global sales in excess of $10 billion, has entered into discussions with Pintoresco Advisors, seeking to engage a range of advising services. 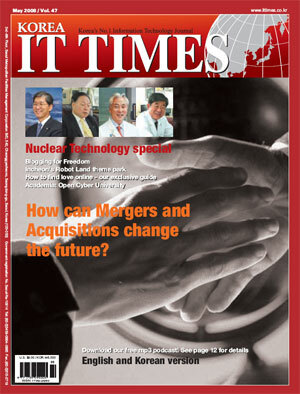 Dongbu Group's IT Services Division, DIT, is one of the largest and fastest growing Systems Integration firms in Asia. It is seeking services to gain assistance in acquiring high growth, emerging technologies and IT services as well as assistance in launching operations and penetrating the U. S. market. Mr. Chulhee Lee, Director of DIT's Future Technology Research Institute stated that he sought out Pintoresco because of his "trust in [Pintoresco's] compentences and eagerness to satisfy customers' business requirements." "We could not be more pleased," stated Joel Peterson, Pintoresco's CEO, "We are honored that the Dongbu Group, a world class firm, has approached us. I know that our unique set of skills, quick response, exceptional customer focus and knowledge of both Korea and the U.S. will allow us to deliver the results that Dongbu is seeking." Byung Chan Ahn & Co. CPA's, Inc. teams up with Pintoresco Advisors, LLC. Byung Chan Ahn & Co. CPA's is one of the largest leading providers of accounting, tax advising, audit and payroll services providers to the Korean and Korean American communities in Southern California. The firm has offices in Los Angeles and Orange County and employs 13 staff accountants. Founded in 1993, the firm has grown to be one of the top two largest accounting firms serving this market segment. Byung Chan Ahn & Co. CPA's and Pintoresco signed this strategic partnership agreement to bring the unique strengths, skills and expertise of each firm to each other's clients. 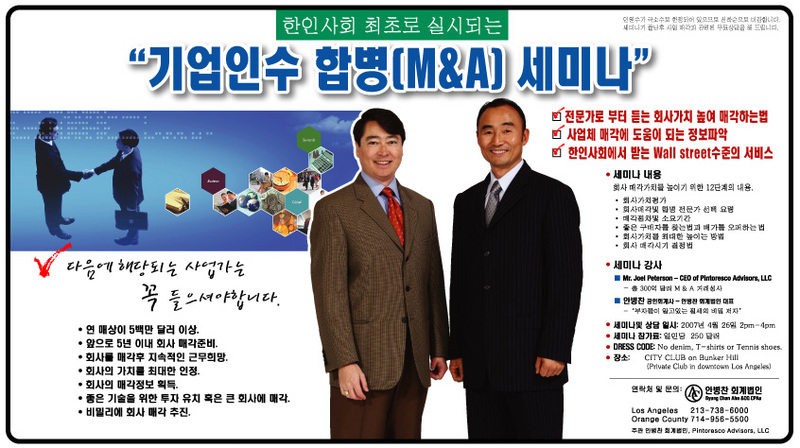 Through the partnership, the firms will bring world class M&A, strategic advising and corporate finance expertise and services to the Korean and Korean American markets. These services have never been available in this manner to these market segments before in Southern California. "Pintoresco Advisors brings a new level of professionalism and a new set of services that can benefit my firm's existing and future clients," said Mr. Byung Chan Ahn, president of Byung Chan Ahn & Co. CPA's, "The Korean community in Southern California and elsewhere is highly entrepreneurial, with many privately held companies. Theses companies and business owners do not have access to the M&A and other services provided by Pintoresco. At one time or another, all business owners need such services as business valuation, assistance with selling or transferring their business, advise on acquisition, merger or divestiture deal structure - should it be all cash or all stock or a mix, as well as many other complex issues." Mr. Ahn additionally pointed out, "The talent and experience level among Pintoresco's Principals is unmatched. From Wall Street firms like to Goldman Sachs and Bear Sterns to Fortune 500 companies like AT&T, Wachovia and MCI, the depth and breadth of experience among Pintoresco's team is impressive. With more than $30 billion in successful M&A deals, Pintoresco's team is second to none and I am very pleased to make available their services to the Korean community." "We are exceptionally pleased to have been chosen by Byung Chan Ahn & Co. CPA's to be their partner," stated Mr. Kevin Flannery, Pintoresco's Vice Chairman, "Mr. Ahn has been a visionary all his professional life and we could not be more please to partner with him and help to make true his vision of providing Wall Street class M&A services to his clients and to the Korean community. My experiences at Goldman Sachs and at Bear Sterns lead me to concluded that we have created a unique set of strengths, skills and expertise that will be a powerful resource for the Korean community in Southern California and elsewhere." "We are very fortunate to be chosen by Byung Chan Ahn & Co. CPA's as their partner," said Mr. Joel Peterson, Pintoresco's CEO, "With their knowledge of the Korean community - its language and culture and its unique needs - combined with our skills and expertise, I know that, together, we offer critically needed services to Korean and Korean American business owners that are not just powerful, but cannot be found anywhere else. Whether it's the accounting needs associated with a merger or sale of your company, or it's the marketing and business planning necessary to launch a new product, or the need to have expert, defensible valuation of your business so you can pass it on to your family or business partners, the team of Byung Chan Ahn & Co. CPA's and Pintoresco Advisors can meet your needs and exceed your expectations." Copyright © 2017 Pintoresco Advisors, LLC All rights reserved.